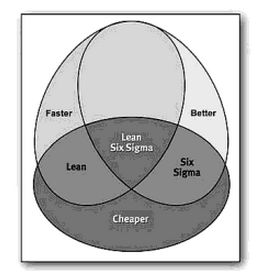 Sh*t Lean Sigma Says: This Lean Sigma Book Thinks Lean is Only About "Faster and Cheaper"
This Lean Sigma Book Thinks Lean is Only About "Faster and Cheaper"
Lean is only about Faster and Cheaper?? Wrong. Lean is about Better, Faster, and Cheaper. The Lean Sigma people ignore the quality methods and quality tools that are a core part of Lean and Toyota Production System. "Better" is not the exclusive domain of Six Sigma. Sorry, just not true. "Everyone is entitled to his own opinion but no one is entitled to his own facts." The book further explains that Lean is about "productivity" and Six Sigma is about "Quality." Wrong!